I chose North Vietnam &Laos for my trip this year. Firstly, we have appointed a new agent in Laos, and we want to promote this fascinating country more, and secondly we have lots of new hotels to see in Northern & Central Vietnam - Hanoi, Hue &Ha Long Bay and so on. Arriving in Vientiane, we checked into the brand new 5* Don Chan Palace hotel with its imposing position on the banks of the Mekong River. In this excellent location has been built a 14-storey hotel resembing a wedding cake in white & pink. It is the first high-rise building in Vientiane, and is sadly no credit to the city, being a bit of a blot on the landscape, and we don't understand how it has come to be built. We decide not to use the hotel for our clients. An afternoon meeting with our new agent was very successful and I am confident that from now on we can provide a better service & tours for our clients choosing to come to Laos. The hotels in Vientiane that we have been using up to now remain unchanged, but we add the 3* Inter City hotel in our standard category. The Inter City has been totally refurbished since we were here last year. The style of the hotel is unique - decorated all in local style, with lots of art and sculpture displayed in the foyer & sitting areas. 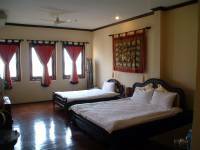 The rooms are simply decorated but in an artistic way, and some of the rooms have view over the Mekong River on the other side of the road. Next day we caught a flight to Xieng Khuang, to see the famous 'Plan of Jars'. This rural area has just a simple runway &a small box-like building for its departure &arrival terminal. It is so lovely. Our guide, Khamla, & driver were waiting at the open departure &arrival platform to welcome us. There is no barrier &we just walked out to the waiting car. 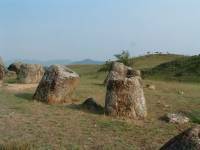 It is only a short drive from the airport to 'site 1', the largest site of the Plain of Jars. (There are three main sites.) Scatterered over the hillside are hundreds of large stone Jars of different sizes, open to the sky, it is an amazing scene. Many of the jars have fallen or been broken over time, especially during the bombing of the war in South East Asia in the sixties & seventies. There are many theories about the jars, but it is most likely that there were sarcophagi, used for burials of the village people thousands of years ago. We drove on another short distance to see Site 2. Sites 2 and 3 are smaller than Site 1 and Site 3 is about another half-hour by car. In the late afternoon we drove to Phonsavanh & checked in at the delightful 3* Phouphadeng Auberge mountain lodge (The 'Auberge de Plain de Jars). This lodge is situated on a hillside with stunning views of the valley & mountains beyond, in a very a peaceful location. 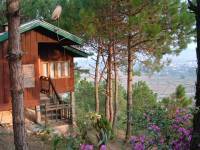 The accommodation is in a simple lodge style that blends beautifully with the environment. There are fireplaces in all the rooms, where fires can be set during the winter - it can get quite cold here in the mountains. The sounds of insects echos through the night., joined by the chorus of birds in the early hours of the morning. It is a nice change from the city. There is a bar &restaurant for food and drinks to linger over in the evening. Sanya, the pleasant &handsome manager joins the guests from time to time, making for a very friendly atmosphere. The Auberge was built by his French father over ten years ago. We woke at dawn next morning. A simple breakfast of French bread, Laos coffee &eggs was delightful, as was the fish dish we had enjoyed the previous evening. Today we drove back to Vientiane by car. The road winds down through stunning mountain scenery, fields, villages of wooden stilt houses - a long journey, approximately 4-5 hours to Vang Vieng but well worth the trip. It was such a joy & so refreshing to see these natural landscape beauties without any sign of commercial activities. We stopped at Vang Vieng for lunch & sightseeing. 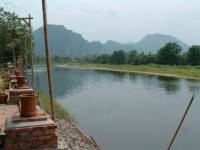 Vang Vieng is a lovely little town resting by the Nam Song River. A popular trip to Vang Vieng is for a day trekking in the mountains & villages. There are several caves that can be visited, & cruises along the Nam Song River. The town is full of restaurants, hotels, guesthouses & shops, and is very popular with backpackers. We have found 3 hotels to use for overnight stay on our tours. The simple local style of the Nam Song hotel with its lovely gardens by the river suits us for our standard hotel & the lovely Sayo Riverside hotel with the river at its doorstep is for our superior category. All the rooms at Sayo are built like little lodges with a sitting porch area facing the river. The rooms are decorated nicely in local style. We are going to offer the Thavonsouk hotel deluxe river view room as our deluxe hotel offering here. 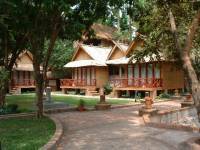 The large bungalows are set in green lawns leading to the river. Time for a delicious lunch of fried rice with shrimp & fried Thai noodles with chicken, all washed down with Beer Lao - simply wonderful. We repeated the same order &pigged out. After lunch we drove on to Vientiane with a visit to Nam Ngum Lake on the way. This huge artificial lake was created by damming the Nam Ngum River & flooding the valley. The boat trip on the lake is very pleasant to see many islands & the floating fishermen's village. From here we drove on about 2 hours to Vientiane.